In July 2010, Steve Green, president of the Hobby Lobby chain of craft stores, travelled to the United Arab Emirates to inspect a massive hoard of ancient artifacts. Pitching Green and Carroll that day in the UAE warehouse were two Israeli antiquities dealers and a third local dealer (all unnamed in the complaint.) They were offering some 1,500 cuneiform tablets, 500 cuneiform bricks, 3,000 clay bullae, 35 clay envelope seals, 13 extra-large cuneiform tablets and 500 stone cylinder seals, according to a federal forfeiture complaint filed last week. The sample of those objects made available for inspection that day bore several hallmarks of the illicit antiquities trade. They belonged not to any of the three dealers present but to a fourth, who claimed they had come from his “family collection” in Israel. As for their provenance, the dealers claimed the objects had been “legally acquired in the late 1960s” from “local markets.” Bizarrely, they also said the objects had been sent to Mississippi for storage in the 1970s and had most recently been in Washington DC before being shipped to the UAE for that day’s inspection. The final red flag: the objects were being sold at a deep discount. Carroll thought the objects were worth approximately $11.8 million, but were being offered for sale that day for just $2 million. After Green got back to Oklahoma City, where Hobby Lobby is based, the company’s in house lawyer contacted an expert in cultural property law. According to the complaint, in August 2010 that unnamed expert travelled to Oklahoma and gave a presentation to Green, Carroll and the company lawyer on the laws governing the purchase and importation of cultural property. The presentation is cited prominently in the government’s recital of evidence leading to last week’s civil forfeiture of 5,500 ancient objects that Green bought in December 2010 for $1.6 million. An interview with Green’s expert, however, suggests a different story: Green and his advisors were given detailed guidance from one of the leading legal minds on antiquities acquisitions, and then chose to ignore it. I have confirmed that Green’s unnamed expert was Patty Gerstenblith, one of the country’s leading experts in cultural property law and a professor at DePaul University. I reached Gerstenblith yesterday while she was in The Hague participating in an Expert Consultation on Policy on Cultural Property at the Office of the Prosecutor of the International Criminal Court. What follows are excerpts from our conversation about her work for Hobby Lobby, edited lightly for length and clarity. Chasing Aphrodite: How did you start working as an advisor for the Greens? Patty Gerstenblith: The in house counsel – I’d rather not name the person, as they’re not named in the complaint – asked if I would be willing to explain the legal issues involved in importing cultural works and antiquities, what laws would pertain. This was 7 years ago. They were planning to build the collection. 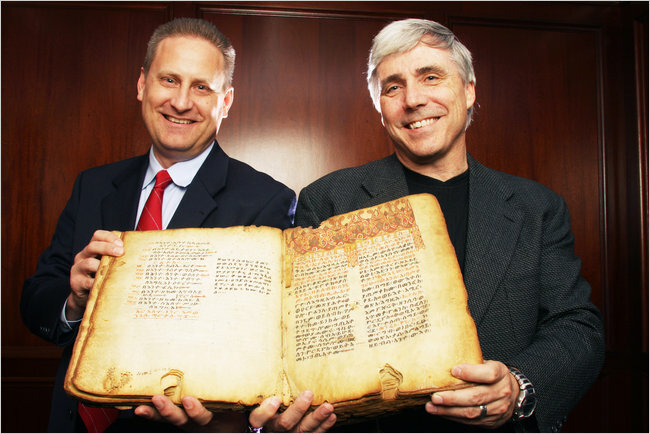 I had never heard of Hobby Lobby but saw they had recently acquired a medieval manuscript that had almost singlehandedly changed the market. I agreed to advise them. CA: Were you hired as legal counsel? CA: Can you describe the presentation you gave to Hobby Lobby executives in Oklahoma City on August 10, 2010? PG: It was a board room or seminar room. There were between 10 and 15 people there. The in house counsel, and the advisor. Steve Green was there to my memory. I don’t know if he stayed for the entire presentation. I have no idea who the other people were. I gave them very general information about laws that applied to importation of antiquities, the same I would do in a public lecture. I went through the National Stolen Property Act, declarations of value and country of origin…. CA: What was their reaction to your presentation? PG: I can’t say they reacted one way or the other. They didn’t seem surprised or upset, which in hindsight is kind of surprising. The impression I had at the time was that they were only considering buying antiquities. I had no idea until I read the complaint [released last week] that this was already in process. They had already earlier in July, before I talked to them, looked at cuneiform tablets. You would think if I’m talking about… you have to do this and that and they’re already in negotiations, they would have had some reaction to what I said. I’m pretty mystified why they bothered to have me do this for them. CA: Did they ask specifically about laws pertaining to Iraq or the Middle East? PG: At the time I knew their reputation in terms of their interest in things that pertained to the bible. After my presentation, we had a little lunch. That’s possibly when I found out their interest in cuneiform tablets. CA: The complaint says you sent a written report to Hobby Lobby on October 19, 2010. What was the purpose of that memo? Can you provide us a copy of it? PG: When I finished the presentation, the in house counsel asked me to write up a summary. It took me a while to get to it. It summarized what I had presented, but at this point I had been aware they were thinking of acquiring things from Iraq so made sure this was included in the memo. I would regard the acquisition of any artifact likely from Iraq (which could be described as Mesopotamian, Assyrian, Akkadian, Sumerian, Babylonian, Parthian, Sassanian and possibly other historic or cultural terms) as carrying considerable risk. An estimated 200-500,000 objects have been looted from archaeological sites in Iraq since the early 1990s; particularly popular on the market and likely to have been looted are cylinder seals, cuneiform tablets . . . . Any object brought into the US and with Iraq declared as country of origin has a high chance of being detained by US Customs. If such an object has been brought into the US in the past few years and was not stopped by US Customs, then you need to examine the import documents to see if the country of origin was properly declared; an improper declaration of country of origin can also lead to seizure and forfeiture of the object. PG: They didn’t even pass my advice on. I was surprised to learn that in the complaint. Why did they both having me do this? The memorandum I wrote was never circulated beyond in house legal counsel, and they were already in the process of acquiring these objects. CA: Was there any follow-up? Did they ask you to review any specific cases or documents after that? PG: My involvement as an expert for Hobby Lobby ended after I gave them the memo. There was no follow-up, no review of specific cases or documents or any specific objects pertaining to importation. I never evaluated anything for them. CA: According to the federal complaint, they later did the very things you warned against. Do you think they used your advice to break the law rather than to follow it? In other words, do you feel used? CA: Many have asked: why were there no criminal charges in this case? As a law professor, what’s your answer? PG: There is a lot here that does read as a red flag. Shipping boxes to various locations. Mislabeling cuneiform tablets as ceramic tiles. These have in many cases been the hallmarks of intentional violations of customs laws. Yes it looks like there was criminal activity, but its not clear who committed the crime. The government would have to prove criminal knowledge beyond a reasonable doubt. A jury would have to find that these people knew not only what the law was but also that they were responsible for how the stuff was falsely labeled when it was imported. I have to assume the government felt it would have difficulty proving who knew what. One difference from the Schultz case is the number of people involved. Schultz was doing it all himself. Here there were so many people involved, they’ve created plausbile deniability as to who knew what. CA: In your view, what deterrent effect do seizures like this have without criminal prosecutions? PG: The trend has, unfortunately, been away from prosecution. There’s a tendency to be happy with forfeiture. These cases in general have very little deterrent effect. Most collectors and dealers, having to return an object, thereby loosing the vaulue, is not really a big financial loss. In the case of Hobby Lobby, not at all. Therefore, its not a deterrent. I have come to believe that criminal prosecution is the only effective deterrent. I’m not the only person who’s made this comment.